Minhang District (a prime area) was Shanghai’s first expatriate residential area after China’s Open Door Policy, and has moved since then to consolidate its lead in housing expatriates – in fact, much of the local government’s revenue is derived from developing residential housing. Minhang District is home to excellent top tier-international schools, such as the British International School, Shanghai American School and the Euro Campus are all concentrated in this same area, bordering the neighbouring districts of Xuhui and Changning. There are also lots of western-oriented shops and restaurants. Zhudi Town, located near the international schools, is newly developed. It includes luxury condominiums, apartments as well as villa homes. Another relatively new area is Hongqiao Town, which was finished in 2000 to provide for the growing number of expatriates looking to live in villas. Like many expat-friendly areas, Hongqiao has shopping centres, grocery stores and even a golf course. 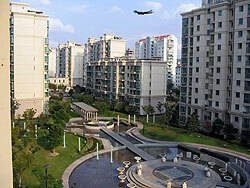 It is Shanghai’s first family oriented suburb. The deluxe villa complexes found in this area are highly priced, and much in demand. Lastly, the popular expatriate community of Gubei Town continues to serve expats looking to pay less than in the downtown area. Minhang has some tourist attractions, such as Qibao Ancient Town, which has a history of over 1,000 years.